Garden accents part two. 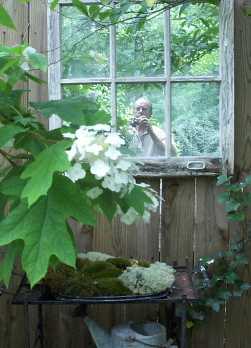 – Johntheplantman's stories, musings, and gardening. Posted byJohn P.Schulz	 June 6, 2010 May 26, 2014 1 Comment on Garden accents part two. Special places in the landscape garden—part two. 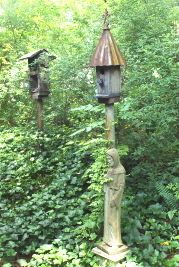 Special places in the garden intrigue me and I keep finding more to share. This week’s article started with a trip to prune a loquat tree which is not supposed to be able to take the north Georgia climate. I don’t know if the loquat will take the climate or not, but it’s been thriving here for over 20 years. Mrs. Milner gave me a list of extra jobs to do and left to get her hair done. While working, I took a break to walk around the back yard. When I drove into the driveway behind the house, I was rather taken with the back yard garden entrance which features a set of steps that proceed up the center of a brick retaining wall. 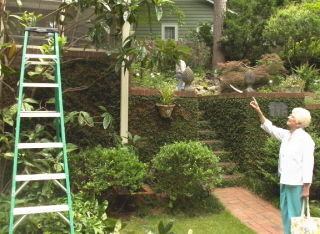 The retaining wall is covered with fig vine (ficus pumila) which is one of the easiest to control of the climbing vines. 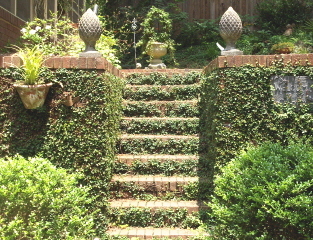 I also enjoyed the topiary at the top of the steps which seemed to serve as a subtle invitation. Fig vine softens the brick retaining wall and steps. The topiary suggests a treat at the top. 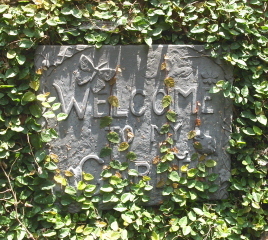 I was taken by the “welcome” sign which added a touch of age and interest to the wall. I laughed when I thought of pruning the vine to the outsides of the plaque and how that act would incur the wrath of Mrs. Milner. 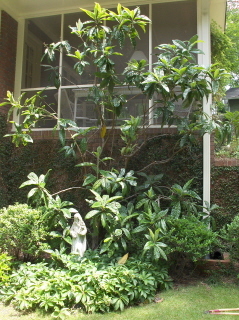 The loquat is located to the left of the entrance, going up, and is getting a bit stringy. It has faithfully produced fruit for many years, but the squirrels feasted on it this year. We had decided that a careful trimming would help to improve the strength of the stems. Loquat needs trimming in order to strenghten the trunk. I like the little accent garden below. I had done a bit of work on the ladder when Mrs. Milner got back from the beauty shop and I couldn’t resist taking her picture as she critiqued my cuts and made a few pointers. She is one of the most knowledgeable plant people I have met during my years as a “landscape artist”. I enjoyed this touch. Instead of an arbor leading to a garden, there was a nice slate patio and sitting area with the arbor to the rear, signifying another “room” to the back yard. 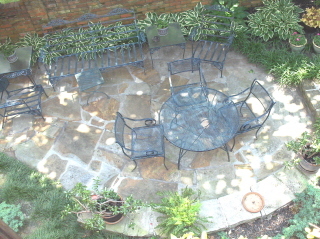 A nice water feature is to the left of this patio, but I will save it for an article on water features. an arbor behind the slate patio suggests yet another treat. 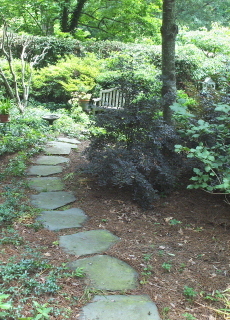 As I looked from the patio through the arbor, I found a most inviting garden path of flagstone which led to a meditation bench at the rear of the yard. The bench is backed up by a rather large planting of mountain laurel. I could imagine sitting here and listening to the birds with a morning cup of coffee. I looked around, enjoying the subtle plantings and noticed a very nice oak leaf hydrangea. On further examination, I saw a little creation below a window that looked through the fence into another beautiful garden. 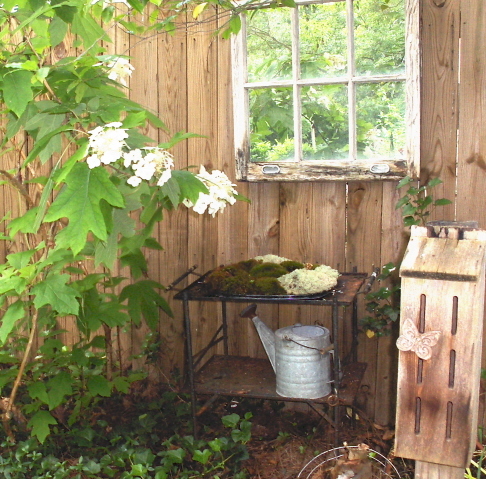 I enjoyed the potting bench, watering can, and butterfly house that had been added for interest and intimacy. Is that another beautiful garden through the window? WAIT! It’s not a window! I giggled quietly to myself as I took another picture of the window and found myself taking pictures of…ME! So, it wasn’t really a window, the glass had been replaced with mirrors. The French call this “trompe l’oeil”, meaning “something that fools the eye.” Trompe l’oeil can be accomplished in many ways and mirrors are very effective. I could smell the gardenia and I enjoyed the bird bath below it. 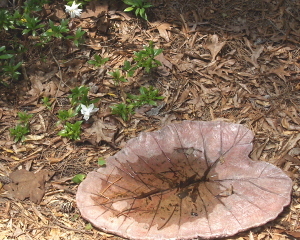 This particular bird bath was cast from an elephant ear leaf and colored with acid stain. It was most likely made by the DIGGS program, which is a local (Rome, Ga.) organization dedicated to providing housing for the handicapped. 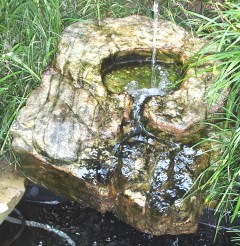 Elephant ear bird bath, molded with concrete. Being rather tall (6’3”) I am often asked to fill bird feeders. As I walked around the side of the house to do so, I admired the privacy planting on a hill between Mrs. Milner’s house and the rental property next door. boxwood privacy screen with statuary and bird feeders. I had a little time left in the day and I decided to go up on Mt. Alto and do a little flower planting for Nelson and Yolanda Magee. 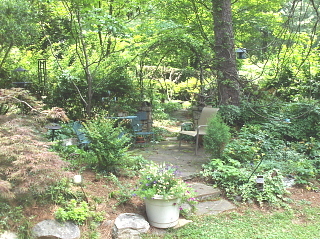 This is a yard that I renovated about twenty years ago and have worked on off and on since. 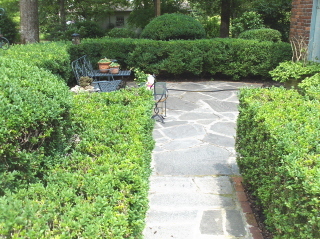 One of the most striking features of the yard is a slate patio surrounded with meticulously maintained boxwoods. Grey slate was readily available maybe thirty or more years ago, but there is little or any to be found these days. I think that it is no longer being quarried. A boxwood border such as this takes lots of care and time to establish. To show a totally private sitting area, I walked to the back of the carport and took a picture of the flagstone patio on the lower floor level. It may be accessed by a walkway around the side or from the inside down a set of narrow steps that aren’t suitable for tall people. I love this area. 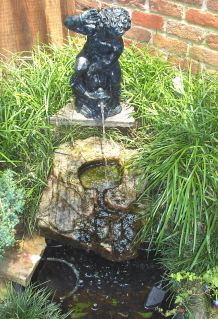 A water feature in a secluded corner off the patio adds the gentle sound of falling water. A slight sound of falling water for ambience. For the water to fall on, about 18 years ago, I took a sandstone rock to a monument company—I figured if they could put inscriptions on tombstones, they could do what I wanted. It took several hours for the sand blaster to make the rock look like water had been falling over it for hundreds of years. After almost twenty years, the rock has gained not only the shape of age, but also a wonderful patina. I hope you got some good ideas, or at least enjoyed the tour. Is it any wonder that I love my job? Got Questions? Enter a comment. I always try to answer. I try to put up a new article every Sunday. Stay in touch. Share it with your friends. wherdepony@bellsouth.net . Do not send pictures or attachments as they will be deleted. 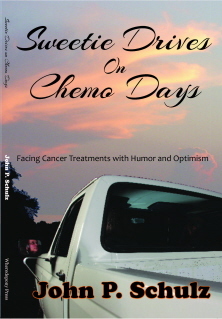 or the print edition. The cover is worth the price. Pingback: Use Decorative Chain to Support Vines and Climbing Roses on a Wall | Johntheplantman's stories, musings, and gardening.